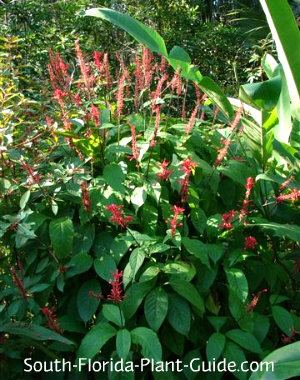 The natural charm of firespike is its unbeatable combination of big green leaves topped by tall, ruby-red flower spikes that attract hummingbirds and butterflies - and it even blooms in shade. 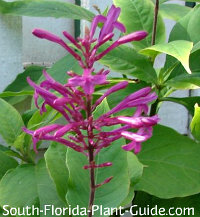 One of South Florida's best plants for hummingbirds, this shrub flowers on and off all year, even in shady spots. Few flowering plants for shade provide such a striking burst of color. And firespike's upright growth habit makes it a good fit in small or large yards. It can work well tucked into a more formal landscape as a backdrop plant for smaller, manicured shrubs. 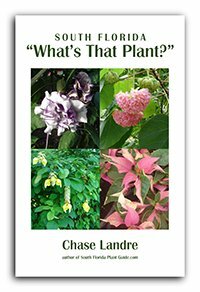 This plant also makes an excellent accent in a tropical garden bed. There's even a purple-flowering variety, though the red is more commonly available at nurseries and seems to be a bit more hardy. 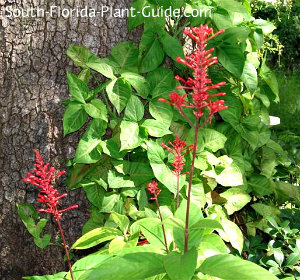 These plants are moderate growers you can keep about 4 to 5 feet tall. Although they'll grow in full sun, they seem to prefer a home in part sun to part shade. Though you won't get as many flowers, these plants thrive in full shade as well. This shrub does best in Zone 10, though you can use it as a container plant in Zone 9B and bring it indoors during colder weather. Avoid windy locations - the branches aren't strong enough to withstand them and the plant can sustain cold and wind damage. 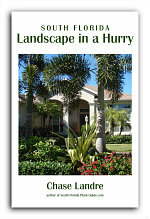 Give the plant a hard pruning in spring for size, then let it grow up to form a nice, natural shape. This shrub can get a bit "floppy" around the edges so cut off side branches now and then if needed. You can also plant it close enough to other shrubs to bolster the sides...and this can help protect it from cold and wind. Water regularly. Fertilize 3 times a year - in spring, summer, and autumn - with a quality granular fertilizer. You may want to supplement feedings with bone-meal and/or liquid fertilizer to promote heavier bloom. Plant 2-1/2 to 3 feet apart. come out from the house 2-1/2 to 3 feet. If planting along a walk or drive, come in 3 feet. These shrubs work fine in containers. 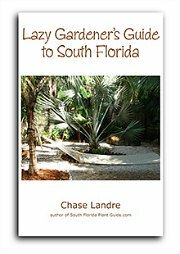 COMPANION PLANT SUGGESTIONS: Hope philodendron, firebush, pinwheel jasmine, white bird of paradise, tibouchina grandifolia, blue porterweed, star jasmine, and cat palm.